Since I still have mung bean filling leftover from my Purple Sweet Potato Ang Ku Kueh, I used it to make Pandan Che Ku Kueh by using the recipe adapted from “No-Frills Recipes”. The method is slightly different. It uses more glutinous rice flour. Together with the pre-prepared dough, it resulted in a kueh with a more bouncy bite. 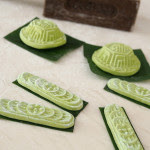 Banana leaves to cut into pieces slightly bigger than the shape of the mould. 3. Remove from steamer. 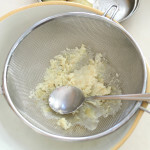 While beans are still hot, place beans, sugar and oil in a food processor and process till fine. 1. 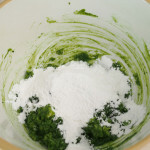 Mix the ingredients (A) till it forms into a ball of dough. 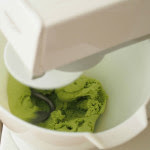 Keep covered and refrigerate overnight. 2. 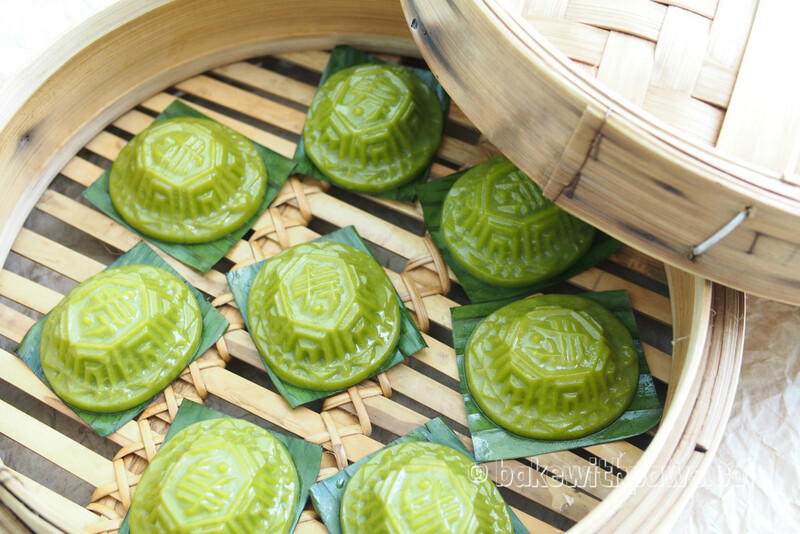 Mix Pandan juice with rice flour and oil. Mix till smooth. 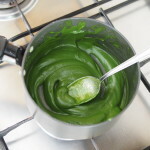 Cook over low heat, stirring to make a smooth paste until the mixture will start to have “lines ”. Keep aside. 3. Peel, cut and steam about 200 gm sweet potatoes for about 15 to 20 minutes or till soft. Mash the cooked potatoes with a potato riser. If you do not have potato riser, you may push the potatoes through a sieve as I did (see above) to yield 150 gm sweet potato paste. 4. 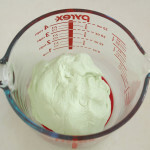 Add the green Pandan paste into sweet potato paste and mix well. 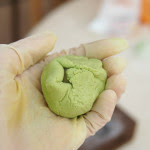 Add the glutinous rice flour dough made the day before. 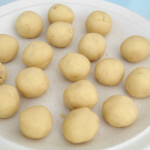 Mix in 60 gm of glutinous rice flour and knead thoroughly till well combined and doesn't stick to the hand. a). Brush banana leaf with vegetable oil. b). 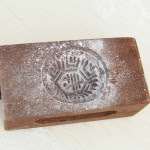 Lightly dust the mould with glutinous rice flour. c). 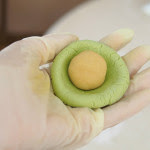 Flatten the sweet potato ball, place a mung bean ball, cover and shape into round ball. d). 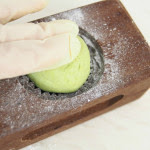 Place the ball in the mould, press evenly, then knock out and place on the oiled banana leaf. e). Arrange in a bamboo steaming tray and steam for 8 minutes over medium heat. f). 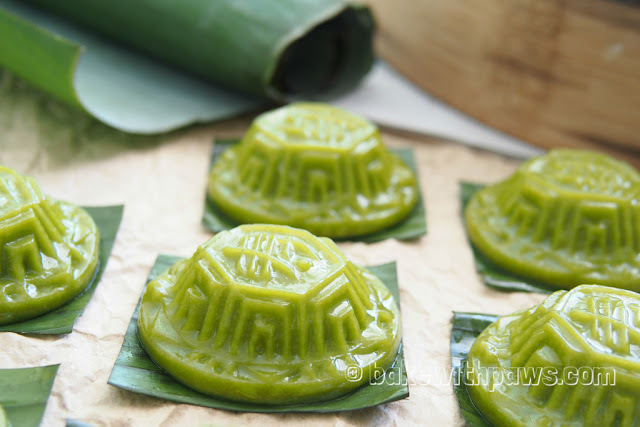 Remove from steamer and immediately brush the kueh with some oil. 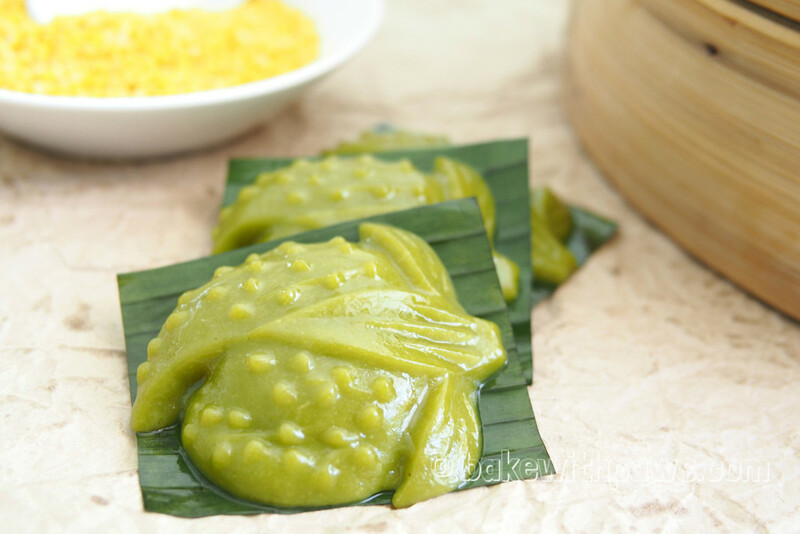 As I soaked the mung beans for 2 hours, the steaming time required was less than 45 minutes. You may also knead the dough by hand but I let the machine do the work. Different potatoes have different textures. It may be soft and some are harder. Please do not add all of water in one go. Add the amounts gradually till you get a soft dough. 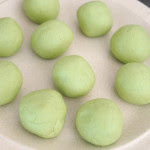 If the dough is too soft, you may adjust by adding a little more glutinous rice flour. 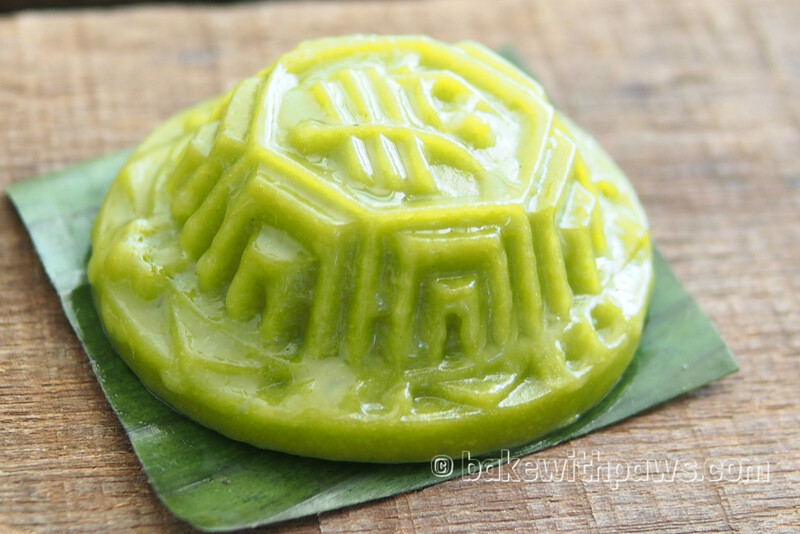 Please do not over steam the kueh as the Che Ku will loss it's shape.